Suppose X is a random variable with a t distribution with 4 degrees of freedom. 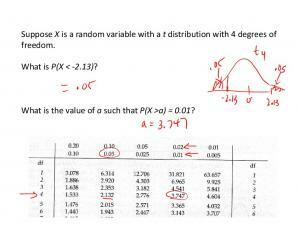 What is P(X < 2.13)? What is the value of a such that P(X >a) = 0.01? If Technology Isn t, Then what is? with the initial condition x(t0 ) = x0 . To simplify notation, we will frequently omit the independent variable when referring to x(t) and write simply x˙ = f (x, t). in Section 6.3, and we will discuss general techniques for finding exact solutions for several types of equations in the coming sections. However, in this section we will concentrate on direct numerical techniques for approximating solutions. Indeed, knowing the difficulty of evaluating ordinary definite integrals, it is not hard to believe that many, if not most, differential equations may be solved only through numerical approximation. Although the function x in equation (8.1.3) is unknown, we do have enough information to find its best affine approximation at t0 . Namely, the best affine approximation to x at t0 is T (t) = x0 + x(t ˙ 0 )(t − t0 ) = x0 + f (x0 , t0 )(t − t0 ). (8.1.6) Hence, from our work with Taylor’s theorem in Section 5.2 and assuming f (x(t), t) is a continuous function, we have x(t) = x0 + f (x0 , t0 )(t − t0 ) + O((t − t0 )2 ). x(t0 + h) = x0 + hf (x0 , t0 ) + O(h2 ). with initial condition x(t0 ) = x0 on an interval [t0 , t1 ], choose a small value for h > 0 and an integer n such that t0 + nh ≥ t1 . Letting sk = t0 + kh, k = 0, 1, . . . , n, compute x1 , x2 , . . . , xn using the difference equation xk+1 = xk + hf (xk , sk ). Then xk is an approximation for x(t + kh). The graph of our approximate solution is shown in Figure 8.1.2.  h xk+1 = xk + hf xk + m, sk + 2 for k = 0, 1, . . . n − 1. Then xk is an approximation for x(t0 + kh). Find x(t), the height of the object at time t. At what time does the object reach its maximum height? What is the maximum height reached by the object? At what time will the object strike the ground? 5. Use the second order Runge-Kutta method to approximate solutions to the equations in Problem 4. 6. In 1990 the population of India was 853.4 million. If P (t) is the population of India t years after 1990, suppose P satisfies the differential equation P˙ = k(t)P, where k(t) is the rate of growth of the population at time t. For example, at the start of 1990 the population of India was growing at a rate of 2.1% per year, so k(0) = 0.021. (a) Suppose the rate of growth remains constant; that is, suppose k(t) = 0.021 for all t ≥ 0. Find P (t). In what year will the population reach 1 billion? In what year will it reach 2 billion? In what year will it reach 3 billion? k(t) = 0.01(1 + 1.1e− 30 ). Use the second order Runge-Kutta method to approximate P over the interval [0, 100] using a step size of h = 0.1. In what year will the population reach 1 billion? In what year will it reach 2 billion? In what year will it reach 3 billion? (c) Plot your results from (a) and (b) together. 7. In the final example in this section we considered the problem of an object in free fall when the air resistance is proportional to the velocity of the object. Now consider the case where the air resistance is proportional to the square root of the speed. (a) If s is the speed of the object, in feet per second, t seconds after it is released, explain why s satisfies the differential equation √ s˙ = 32 − c s, s(0) = 0, for some constant c > 0. (b) Using c = 1, use the second order Runge-Kutta method to solve the equation in (a) over the interval [0, 500] using a step size of h = 0.5. Plot your results. (c) Does the object appear to approach a limiting speed? If so, what is the terminal speed? (d) Solve the equation √ 32 − c s = 0 for s. Explain the connection between this answer and your answer in (c). 8. In the final example in this section we considered the problem of an object in free fall when the air resistance is proportional to the velocity of the object. Now consider the case where the air resistance is proportional to the square of the velocity. (a) If v is the velocity of the object, in feet per second, t seconds after it is released, explain why v satisfies the differential equation v˙ = −32 + cv 2 , v(0) = 0, for some constant c > 0. (b) Using c = 0.01, use the second order Runge-Kutta method to approximate the solution to the equation in (a) over the interval [0, 20] using a step size of h = 0.02. Plot your results. (c) Does the object appear to approach a limiting velocity? If so, what is the terminal velocity? (d) Solve the equation −32 + cv 2 = 0 for v. Explain the connection between this answer and your answer in (c). 9. Suppose the population of a certain country was 56 million in 2000 and the natural rate of the growth of the population was 2% per year. Moreover, suppose k(t) represents the net rate of growth of the population due to immigration and emigration t years after 2000. (a) Let P (t) be the population of the country t years after 2000. Explain why P should satisfy the differential equation P˙ = 0.02P + k(t), with P (0) = 56. (b) If k(t) = 0.04t, use the second order Runge-Kutta method to approximate the solution to the equation in (a) over the interval [0, 25] using a step size of h = 0.05. Plot your results. (c) What does this model predict for the population of the country in the year 2010? (d) When will the population of the country reach 100 million? Report "Section 8.1. If x is a function of a real variable t and f is a function of both x and t, then the equation"